Our Chuck-A-Luck 18 inch Cage, Dice & Laydown comes fully equipped featuring a stainless steel cage, felt lay-down, and dice. Made of precision-crafted stainless steel wire, our cages are among the most durable available. Each cage is lined on the top and bottom with casino green felt. Chuck-A-luck is played with three standard dice that are kept in a device shaped somewhat like an hourglass that resembles a wire-frame bird cage and pivots about its center. The dealer rotates the cage end over end, with the dice landing on the bottom. Wagers are placed based on possible combinations that can appear on the three dice. 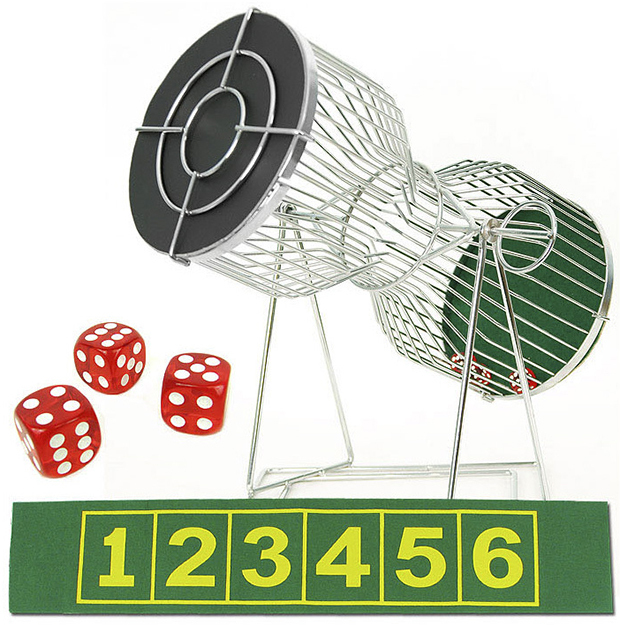 Bets can be that a certain number will come up on one die, (if using the basic enclosed layout) that the three dice will total a certain number, or that the total will be an odd number, even number, a high number, or a low number (shown on professional layout (60-6511s) when the cage stops spinning. Same set-up less one die can be used for over and under with our professional over and under layout 60-6513s. Chuck-A-Luck is a popular game at carnivals, fund raisers and many first-class casinos around the world.